SanDisk today rolled out the sleek SanDisk Extreme Ducati Edition USB Flash Drive. A tribute to Ducati’s distinctive Italian design and engineering, the new drive has the same glossy red chassis and black trim as the Ducati Corse team motorcycles now racking up victories on the MotoGP circuit. Borrowing from the lightning-fast speeds, precision engineering and colorful style of international motorcycle racing, SanDisk Corporation today launched a line of turbo-charged flash memory cards – the SanDisk Extreme Ducati Edition CompactFlash and the SanDisk Extreme Ducati Edition SD Plus. Both have the quickest read/write times of the SanDisk portfolio and represent the company’s ultimate performance products for digital photographers. Kingston announced today that it has posted an interview with legendary photojournalist Harry Benson on its 'Icons of Photography' microsite. A witness to history, Benson shares what it was like to be standing next to Robert F. Kennedy when he was assassinated, how he got his first big break as the only journalist allowed to interview a mass murderer in prison, and how it felt to march with Dr. Martin Luther King, Jr. In addition to his photographic exploits, Benson expresses personal goals such as his longtime desire to become a professional football (soccer) player. 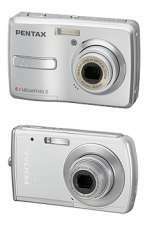 With 8.0 megapixels, the Pentax Optio M40 features an ultra-slim, sophisticated metallic body offering a 3X optical zoom and a large and easily viewable LCD monitor. The user-friendly Optio M40 also features Face Recognition and digital Shake Reduction. The Pentax Optio E40 is an affordable, entry-level compact digital camera also featuring Face Recognition technology and Digital Shake Reduction functions for high-resolution photography. This entry-level model accepts widely available AA batteries and is designed for simple and intuitive operation so that even beginners can enjoy photography effortlessly. The D40x maintains the same compact size, portability and ease-of-use as its already successful sister camera, the D40, and adds features like higher 10.2 megapixel resolution, faster continuous shooting capability and wider ISO sensitivity. Digital SLR cameras are the tool of choice among the majority of professional photographers but some people have found them to be complex or bulky. With the D40x, consumers don’t have to sacrifice the quality of their pictures anymore. The D40x inherits many advanced technologies from Nikon’s professional models, but was designed specifically to make taking outstanding pictures easy and fun for everyone. Scrapbookers and digital photographers have a new reason to celebrate: Canon U.S.A., Inc. has just announced an addition to their compact photo printer line-up that prints superb digital images that can last for years to come. Designed to make printing images a breeze, the SELPHY CP740 Compact Photo Printer features a two-inch color LCD display, red-eye correction and multiple direct printing options that can enable anyone to make amazing prints without a computer. Nikon UK will introduce a summer cashback promotion for customers wishing to purchase the D40 and D40x kit (with AF-S DX 18-55mm II) and D40 and D40x twin kit (with AF-S DX 18-55mm II and AF-S DX 55-200mm). The cashback has been announced to celebrate Nikon’s 90th anniversary and will allow customers to claim back £60 in the UK and €90 within Eire on the above combination of products. The offer is valid for purchases made between June 1st and August 31st 2007. Sony Europe’s IT Peripherals division today announced the addition of a user-friendly, 17-in-1 external multi-card reader to its PC accessories product range. The MRW62E S1/171 multi card reader not only reads 17 types of storage cards including Sony’s Memory Stick range, SD and xD-Picture Card, but also includes Drive Letter recognition software to make it easy to identify different card formats when transferring data. Designed with style and packed with performance, the Canon Pizma MP470 and MP210 Photo All-In-One (AIO) printers announced today by Canon., deliver new ease-of-use and printing technology, boast approximately 46-second 4" x 6" borderless photo printing speeds, and offer functionality in a stylish, compact package. Perfect for the dorm room or home office, both models provide printing, scanning and copying features and require the same amount of desktop space that many single function printers occupy. 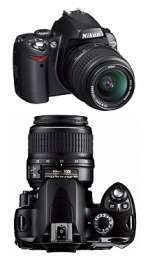 The New Nikon D40 and D40x are the first Nikon body without a built in auto focus motor. This means that the any lens used with the D40 will need the auto focus motor built into the lens. These lenses are called AFS lenses. 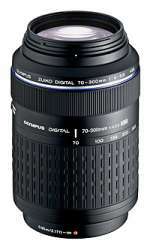 Sigma has a large line of compatible AFS type lenses. Most of these lenses have the HSM motor in them with the Exception of the 80-400mm f4.5-5.6 EX DG OS (optically stabilized). In the dorm room or in the home office, the new Canon Pixma iP4300 Photo Printer offers affordable solutions to photo and document printing needs. Just in time for the back-to-school season, this devices break price barriers by offering valuable yet useful features like individual ink tanks with the smart LED system and advanced paper handling capabilities. 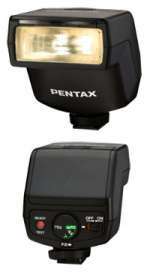 Pentax Corporation is pleased to announce the marketing of the Pentax AF200FG dedicated auto flash for use with its SLR cameras. This clip-on-type flash features a compact, lightweight body, a guide number of 20 ( at ISO 100/m ) and simple dial operation to assure effortless flash photography for everyone. Pentax Corporation is pleased to announce the release of the Pentax K100D Super. This new standard-class digital SLR camera combines the acclaimed Shake Reduction (SR) system with an innovative Dust Removal (DR) system to assure optimum image quality. Craig Minielly, founder and wizard behind the scenes of Craig's Actions, has just released the ultimate set of Photoshop Actions. Entitled the "Production Assistants", these are a collection of One-Touch Complete Workflow Actions that now bring an incredible amount of power and creativity to everyone that uses Photoshop to process their photographic images. This autumn, Olympus introduces the Zuiko Digital ED 70-300mm 1:4.0-5.6. Designed for the specific demands of digital photography, this extreme telephoto lens delivers 4.28x zoom power – up to a phenomenal focal length of 300mm (600mm on a 35mm camera system). Despite such high-performance attributes, this ultra-compact model only weighs in at around half as much as its competition. This makes it the ideal travel lens to accompany any Four Thirds Standard digital SLR.